Our universal capsules are compatible with FAP capsule machines, such as Beauty, Kelly, SGL Capsy, SGL Rotary, etc. Very widespread on the French market, these FAP capsules let you prepare an espresso worthy of the best Italian bars in just a few seconds. Our range of universal capsules offer a wide range of hot drinks (tea, coffee, decaf coffee and flavoured coffee) with renowned brands: Mokador Castellari, Caffè Vergnano, Cafés Richard, etc. Set of 40 FAP Cafés Richard Long capsules compatible with all universal capsule machines (FAP). Start your day with a long coffee. Pack of 40 FAP Cafés Richard Soft capsules, compatible with all universal capsule machines. Try a mild espresso. Pack of 40 FAP Cafés Richard Decaffeinated capsules, compatible with all universal capsule machines (FAP). Perfect in the evening! 100 FAP Decaffeinato capsules by Caffe Vergnano for Vergnano FAP capsule machines and universal capsule machines. Packaged in pairs. 50 plastic MyMokador Gianduja FAP capsules for Mokador Castellari capsule machines and universal capsule machines (also known as FAP capsule machines) such as the Ca-Nano, SGL Rotary, SGL Capsy, etc. A very tasty coffee with an intense hazelnut and chocolate flavour (chocolate spread). 50 plastic MyMokador Caramel FAP capsules for Mokador Castellari capsule machines and universal capsule machines (also known as FAP capsule machines) such as the Ca-Nano, SGL Rotary, SGL Capsy, etc. A very tasty caramel flavoured coffee! 100 plastic MyMokador Big cup FAP capsules for Mokador Castellari capsule machines and universal capsule machines (also known as FAP capsule machines) such as the Ca-Nano, SGL Rotary, SGL Capsy, etc. This blend is a balanced, mellow and flavourful. 100 plastic MyMokador Aroma FAP capsules for Mokador Castellari capsule machines and universal capsule machines (also known as FAP capsules machines) such as the Ca-Nano, SGL Rotary, SGL Capsy, etc. This blend of traditional coffee provide a mellow and well rounded drink characterised by a dense crema and rich hazelnut colour. 100 FAP Espresso 1882 capsules by Caffe Vergnano for Vergnano FAP capsule machines and universal capsule machines. Packaged in pairs. Set of 100 Pellini Top universal FAP 100% Arabica capsules, compatible with all universal capsules machines (also known as FAP capsules machines). 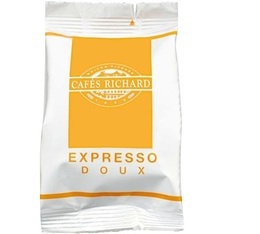 Set of 40 FAP Cafés Richard Intense capsules, compatible with all universal capsule machines. Perfect in a strong espresso. 100 FAP Espresso Crema capsules by Caffe Vergnano for Vergnano FAP capsule machines and universal capsule machines. Packaged in pairs. 100 plastic MyMokador Crema FAP capsules for Mokador Castellari capsule machines and universal capsule machines (also known as FAP capsule machines) such as the Ca-Nano, SGL Rotary, SGL Capsy, etc. A rich, full and creamy coffee. Pack of 40 FAP Cafés Richard Mint Tea capsules, compatible with all universal capsule machines. A delicious, refreshing tea! Set of 40 FAP Cafés Richard Earl Grey capsules, compatible with all universal capsule machines. An essential tea to try! Set of 40 FAP Cafés Richard Breakfast Tea capsules, compatible with all universal capsule machines. A full-bodied tea for a great start to your day! Set of 40 FAP Cafés Richard Milk capsules, compatible with all universal capsule machines. Perfect in a milky drink.